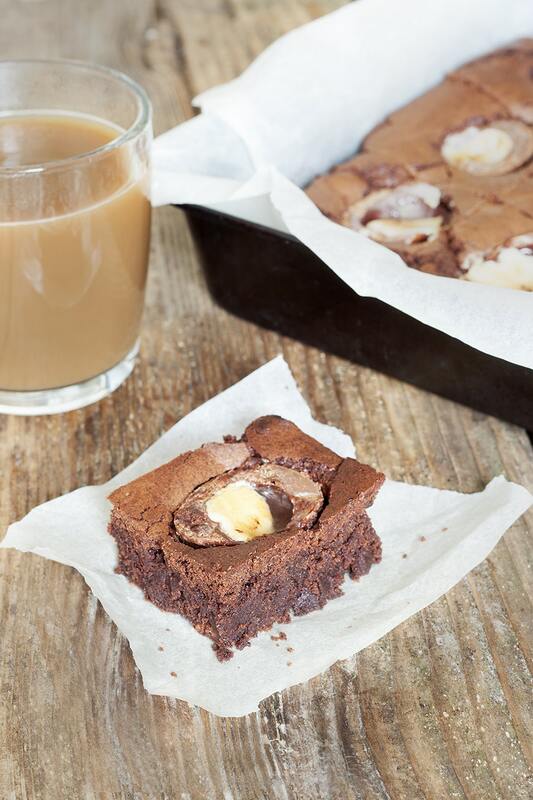 These creme egg tray bake brownies are actually worth going home on your lunch for if you haven’t packed them in to your lunch box…seriously. I was trying my best to start being healthier after a bridesmaid fitting I had this weekend… the fitting made me realise I have two months left to feel and look amazing (ahhhh!!). So I came back from my girlie weekend away thinking that is it! Healthy eating and exercise now, until June. 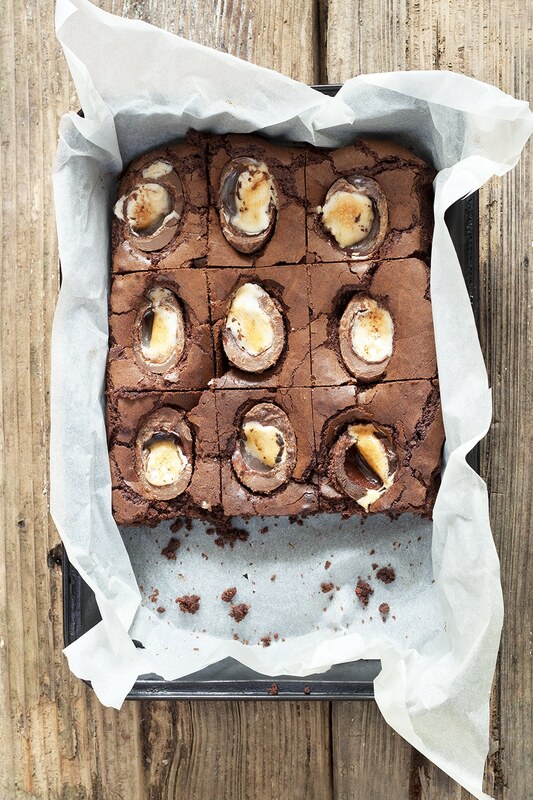 This was all very well until I looked in the cupboard and saw Cadbury Creme Eggs and just had to make these brownies…oops! All in moderation I thought. I made a very healthy light lunch, packed my fruit for snacks and then Monday morning hit like a bomb. So off I popped home and there were the brownies looking AMAZING! Needless to say, my afternoon was so much better after this scrumptious Cadbury Creme Egg brownie fix. Not only that but were going to the Chester Food Festival this weekend as well where I’m sure I’ll HAVE to sample all that’s on offer. They are just so good. Can you resist?! To begin, pre-heat the oven to 180 and gas mark 4. Melt the butter and chocolate together in a bowl over a pan of hot water. Once melted, leave to cool. Mix your eggs and sugar using an electric whisk. This takes time and your mixture needs to double in size and thicken up. Your mix should also be pale in colour. Add you egg and sugar mix to your cooled chocolate mixture. TIP: Make sure your chocolate mixture is at least luke warm, or cooler. If the chocolate mixture is too hot it will cook the eggs! Sift in the flour and cocoa powder and fold everything together. TIP: Take your time and be gentle :)Pour everything into your brownie tray and cook for about 20 mins. Whilst that's cooking, start to cut your creme eggs in half. This is tricky and doesn't always turn out very neat, but don't worry, it will still taste great. If you heat our nice in hot water before every slice it may also help. After 20mins cooking, take out your brownies. They should be looking quite cooked around the egde but still quite soft in the middle. Place your eggs on top of the half cooked brownies and gently press down. I found I could fit 3 across each row. Bake for a further 10 - 15 mins or until cooked through out. Once cooked, leave to cool before cutting. I found these brownies taste amazing warmed up and served with vanilla ice cream! I absolutely would not be able to resist these! Diets do not stand a chance – these look so amazing!! Hope you had a very happy Easter! Hi! These look delicious! I was wondering what size baking tin you used? I tried these, but my yolk didn’t come out as orange as I hoped. Any tips? Hey Louise I noticed the same thing. It must be something to do with baking them losing their colour a bit. I’ve made these so many times and they are delicious! My top tip for slicing the crème eggs is to freeze them for a couple of hours before slicing In half.